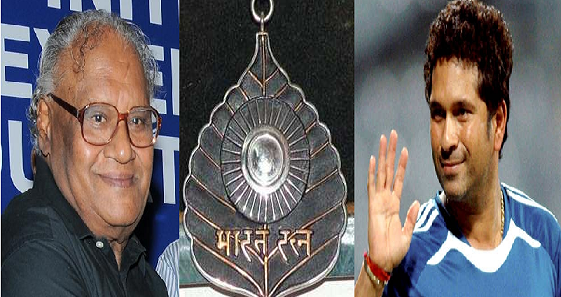 Professor CNR Rao and Sachin Tendulkar today joins the list of the nation's Bharat Ratnas today, 4th February 2014. The President awarded them India's highest civilian honour at a ceremony at the Rashtrapati Bhavan. Dr CNR Rao, 79, is a former director of the Indian Institute of Science, Bangalore, and currently works at the Jawaharlal Nehru Centre for Advanced Scientific Research in Bangalore. One of the most prolific chemists in the country, he still spends several hours every day in his laboratory and has published over 1500 research papers on materials science. He has been in the running for the Nobel Prize for many years. Mr Rao is the fourth recipient of the Bharat Ratna from the field of science. Sachin Tendulkar is the first sportsman to be given the honour; he beat hockey legend Dhyan Chand to get the first Bharat Ratna. At 40, he is also the youngest. A day after he retired from Test cricket last November, Tendulkar dedicated the Bharat Ratna "to all mothers of India."